It’s been a while since I’ve had a chance to write anything, mostly due to work but in part due to simply being to tired. But this weekend I had a chance to recover a bit, do some fun stuff and be lazy without the guilt. Saturday and Sunday were supposed to be for finishing up the bathroom: put in the tile, seal it, install the chair rail and do all of the other finishing work. Unfortunately, the drywall guy we hired did a piss-poor job and the walls were so uneven that we have to tear them out and redo them. At least he was smart enough to give us some money back. But the good news was that it gave us some more time to get other stuff done: we got a new stock pot for making turkey soup, we made another turkey for turkey sammiches, we went to BJ’s for some bulk supplies, etc. But the majority of my fun was from getting out to do something I have not done nearly lately: bird. Monday took me all the way down to Cape May in search of the four rarities there – IVORY GULL, SWAINSON’S HAWK, EURASIAN WIGEON and RUFOUS HUMMINGBIRD. I ended up getting 2 of 4, so not a bad day. I followed it up by seeing another eastern rarity – a SPOTTED TOWHEE – at Palmyra Cove the next day. I got up early – really early – in order to make the trek down to the birding mecca of Cape May, only this time the mecca had some extra rarities to enjoy. 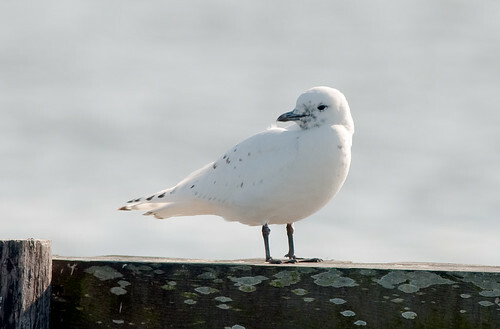 My first stop was the Bree-Zee-Lee Marina where the IVORY GULL – a rarity normally restricted to the arctic – had made a lengthy appearance and was giving people a lot of chances to see it. I got to Cape May very quickly and had no problem finding the place, and I was treated by the fact that the bird was already there waiting. I wasn’t there more than 5 minutes when the bird decided to give us all a flyby and I got great looks at the beautiful white feathers that were starkly different from almost all of the gulls that normally habitate this area. After about 45 minutes, it disappeared and I decided to move on, but I had my first lifer of the day. Reports on the hummingbird had been nil because of the cold weather, so I decided to give the hawk a try. Unfortunately, it – as hawks are wont to do – was flying to other places, so I missed that one. From there, it was a trip over the Cape May Lighthouse with some other birders that I met, where we went looking for whatever might be around, but most especially the EURASIAN WIGEONS, which I had missed a few times before. 3 drakes and a single hen had been seen there earlier, but there was only a single, young drake hanging out when I visited – but it was a enough. My second lifer of the day! 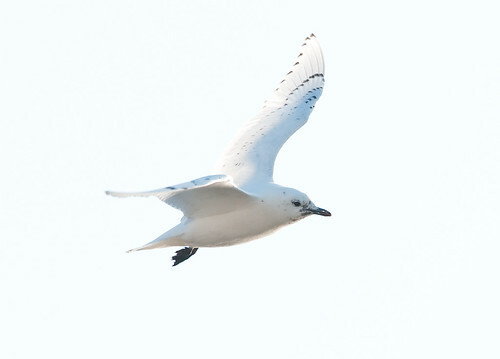 To follow up, I went back to the marina to see if I could get another look at the Ivory Gull — and although it took a bit for me to find him, when I did I was treated to some closer up views, such as the picture below. And then, it was time to drive back. Without even looking too hard, I was able to see quite a few species, including two lifebirds – all by about noon. The next day wasn’t as nice weather-wise – in fact, it was pretty cold – but the destination was literally right up the road, and Shari could join me. We wandered up to the area by the Little Pit where the SPOTTED TOWHEE had been seen, hoping we would make it’s 9:00 a.m. itinerary (the bird seemed to disappear about 9 a.m. every morning). Lo and behold, my luck held from the previous day and it was in it’s accustomed spot almost as soon as we got there. 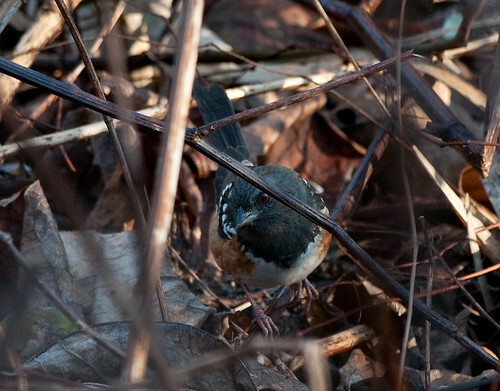 However, getting good looks at the little lady was a little tougher as towhees often enjoy the thickets of brush. But I was able to get a few shots. This wasn’t a lifebird for me – I’d seen them in Vancouver a few years back, but it was a first-of-state bird for NJ for me, and a lifer for Shari (not that she really keeps track). Still, 3 rarities in 2 days was a nice departure from all of the recent work. Now I just have to look forward to my wife’s annual trip to Barnegat and Forsythe for my wife’s birthday.